Aside from the late-80’s/early 90’s Reggie White-era underachieving Eagles, this has got to be the most frustrating and infuriating episode in Eagles history. 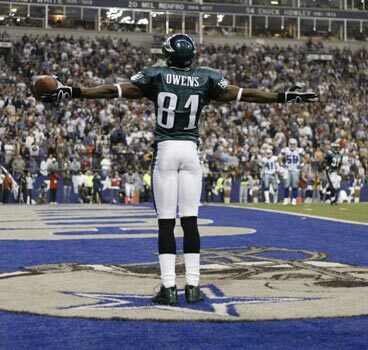 The whole Terrell Owens-on-the-Eagles thing felt doomed from the start(*). We all remember the long, drawn-out soap opera (including his agent, David Joseph, forgetting to file papers voiding the final two years of TO’s 49ers contract, the “trade” to Baltimore, the subsequent protest and arbitration) that famously culminated with TO signing a seven-year, $49 million deal with the Eagles on March 17, 2004. (*)I was “in college” at the time – meaning I sat in my apartment all day, not going to class, getting stoned, watching movies and furiously following every move the Eagles made. I’ll never forget turning to my roommate after the whole Eagles-TO acquisition finally played out and (honest to God) saying “this isn’t going to end well.” I think it was due to the fact that McNabb and Owens instantly became best friends in an odd, forced way. Watching the two of them playfully joke around during interviews on ESPN almost felt like watching a Hollywood sham-marriage – where two stars are “set-up” by publicists to further an agenda (ie. Tom Cruise not being gay). 2004 was one of the most memorable and exciting Eagles seasons ever. Thirteen wins, the most by any Philadelphia Eagles team. The third-highest point total in franchise history (at the time). NFC Champions for the second time in franchise history. The team that finally got over the hump and went to a Super Bowl – though unfortunately without finishing the job. With the 8th ranked scoring offense (would have been in the top-five had TO not broken his ankle in Week 15 and Reid not sat his starters in Weeks 16 and 17) and the 2nd ranked scoring defense, the 2004 Eagles were arguably the best Eagles team to ever take the field. But then the 2005 offseason happened, and everything fell apart. The Eagles balking, and rightfully so. Though Owens was definitely a top-ten NFL receiver, he wasn’t paid like it. But he signed the contract the Eagles offered him and nobody held a gun to his head to do so. Owens taking shots at McNabb’s Super Bowl choke-job, and rightfully so. Owens attempting to play in the NBA Summer League with the Sacramento Kings, and the Eagles denying him. Owens threatening to hold out, but not following through, choosing to submarine the team’s season instead. Owens wearing a Michael Irwin jersey following a brutal loss in Dallas, just to piss off the fans. Owens continuing his assault on McNabb, dividing the Eagles locker room. Owens and a retired Hugh Douglas coming to blows in the locker room in front of the team. The Eagles not celebrating Owens’ 100th career touchdown reception, leading to TO calling the Eagles “a classless organization,” and rightfully so. The Eagles suspending Owens for four games for conduct detrimental to the team and then deactivating him for the remainder of the season. Whether TO was deserving of a raise or not is beside the point. The Walrus, The Devil and The Billionaire allowed their diva wide receiver to hijack a championship-caliber team at the height of its talent, causing an irreversible divide in the locker room and officially outing McNabb – a supposed leader – as a big puss who couldn’t fight his own battles(**). Even worse, the mess was documented on a national stage. Owens was the lead story on ESPN on a daily basis and his antics totally outshined an Eagles team that went 6-10 in 2005. (**)Though the turmoil did give us the classic Sam McNabb “Black-on-Black crime” line, so at least we got that. Sure, the Andy Reid-led Eagles have been back to the playoffs four times since 2004, including one NFC title game appearance, but the Terrell Owens debacle was the unraveling of the Reid-era Eagles. This entry was posted on Tuesday, January 25th, 2011 at 11:10 am and is filed under Reasons to Fire The Walrus, The Walrus. You can follow any responses to this entry through the RSS 2.0 feed. You can leave a response, or trackback from your own site.